Burning media to DVD discs opens up a lot of possibilities for using/storing your digital media and keeping your PC uncluttered and create a little more space. To get the job done, you will have to get some help from DVD burning softwares. There's no shortage of DVD burning software, but tools from the likes of Nero and Roxio can be too expensive for some people. As ever, there are plenty of free options to choose from, but you need to know that you're getting the right tool for the job. If you're looking for a completely free DVD burners, you've come to the right place. In this article, I will introduce the five best free DVD burning tools which are just as capable as their paid-for rivals, covering everything from basic disc burning to impressive video DVD creation. ImgBurn is a popular free DVD burner for Windows 10 and other OS versions that is lightweight and simple to use. The program allows burning CD, DVD, HD DVD and Blu-ray files. It also support writing of images like ISO files and folders and create ISO image from DVD disc. There are several modes for performing an array of functions like Read, Build, Verify, Write, and Discovery. A range of formats and file types are supported by the software like CCD, CUE, DVD, IMG, ISO, PDI, BIN, and others. All latest drives without any updates are supported by ImgBurn. ImgBurn also presents a concise interface where you can get its main features. However, its operation is not as accessible as its main interface. You may cost several seconds to get how to add a file source to burn DVD and the numerous and complex options, like Data Type, File Systems, may confuse you if you don't have technology knowledge on multimedia. Although this top free DVD burning software is actually powerful on burning DVDs at a high speed, you may be a little bothered with the bundled adware and worried if the adware is safe to your PC. ImgBurn has its own disadvantages e.g. it cannot write ISO image files in USB drivers; takes a lot of time to burn files in CD/DVD; Poor graphical user interface, etc. Are you searching around for a better than ImgBurn alternative like others? Check this article: Recommended 5 Free ImgBurn Alternative for Windows. 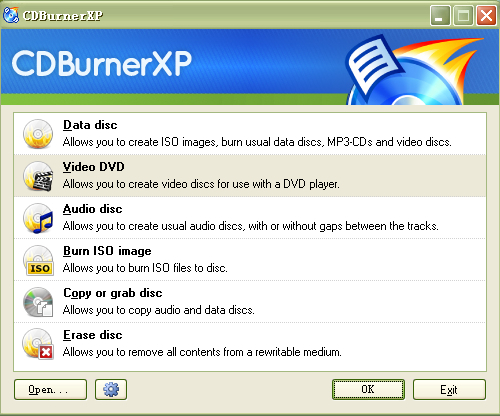 Another one of the best free DVD burning software for Windows are CDBurner XP that allows creating CD, DVD, and Blu-ray discs. The program facilitates burning and creating all types of discs and ISO files. Audio CD with as well as without gaps between the tracks can be created using the software. The multi-language interface allows easy use for all types of users. Additional specifications include creating bootable discs, verification of data after the burning process, multiple discs burning at a time, and others. DBurnerXP has a colorful interface among top 5 DVD free Windows (10) burnning software. Also, it lists key features on the main interface to be convenient for users to quickly find what they want. To be frank, it can be easier operated than ImgBurn but a little complicated than WinX DVD Author. Click Data disc to enter Data compilation and you may need a guide or have several tests to be familiar with contents it shows. In addition, CDBurnerXP requires you to install Windows .NET Framework on your PC at first because it is mostly written in Visual Basic .NET. For this, some people turn to select other DVD burning software rather than installing .NET Framework with a long-time. WinX DVD Author is designed specifically for creating video DVDs. There are some tools for burning data files to disc, but if you're looking for audio CD creation, you're going to have to look elsewhere. 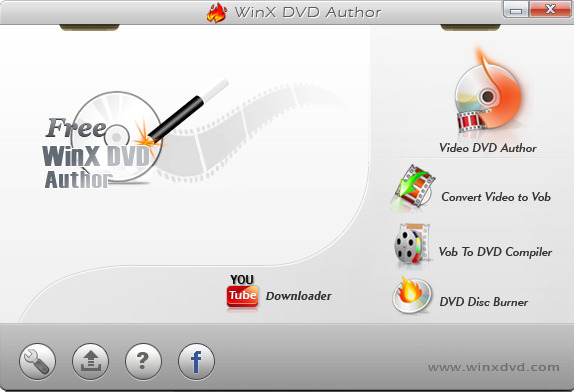 WinX DVD Author has everything you need for working with video, including a tool to download videos from YouTube. You can convert video files in to VOBs ready for burning to disc, or collect together a number of VOBs to create a DVD complete with menus. There's also a DVD authoring component for basic video editing tasks like trimming. You can add subtitles, and there's support for NTSC and PAL, as well as numerous aspect ratio options. Performance is fast, and output quality is high - exactly what you need. BurnAware Free might look simple, but there's more to it than meets the eye. There's support for CD, DVD and Blu-ray burning, and it can be used to create everything from a standard data disc, audio CDs, video DVDs and Blu-rays, disc images, bootable discs, and spanned backups. The interface is sparse, but one of the joys of working with BurnAware Free is that it is so free of distractions - you can just focus on the job at hand without having to hunt high and low for the options you need. Everything is delightfully straightforward, making the program ideal not only for beginners, but also anyone who just wants a tool to get things done as quickly as possible. Keep an eye out for bundled software during the installation to ensure you don't install any unwanted extras. DeepBurner Free is a very traditional-looking DVD burner, and is a free, cut-down version of the more comprehensive DeepBurner Pro. Unlike the premium program, DeepBurner Free can't create video DVDs, but you can use it to burn data CDs and DVDs, audio CDs and bootable discs. You also have the option of working with ISO images. DeepBurner Free has its limitations, but you definitely shouldn't dismiss it out of hand. For everyday burning tasks such as the manual backing up of data and so on, it's a great tool to have in your software arsenal. There's even a portable version of the program so you can pop it on a USB drive and easily take it from computer to computer. DeepBurner Free might not be the most feature-packed DVD burner, but it's ideal for everyday audio and backup disc burning. In the above part, we have discussed various free CD DVD burning software that is quite decent in use and features. But if you have advanced needs and looking for a professional tool, then a freeware DVD burner will not be up to the mark in terms of features, performance, and stability. For best burning and converting needs, you need specialized software like EaseFab DVD Creator that also proves to be the best alternative to free DVD burning software. Compatible with Windows as well as Mac system, this paid software has a free trial version as well. Using the software you can convert and burn almost all types of media files and formats to DVD discs. 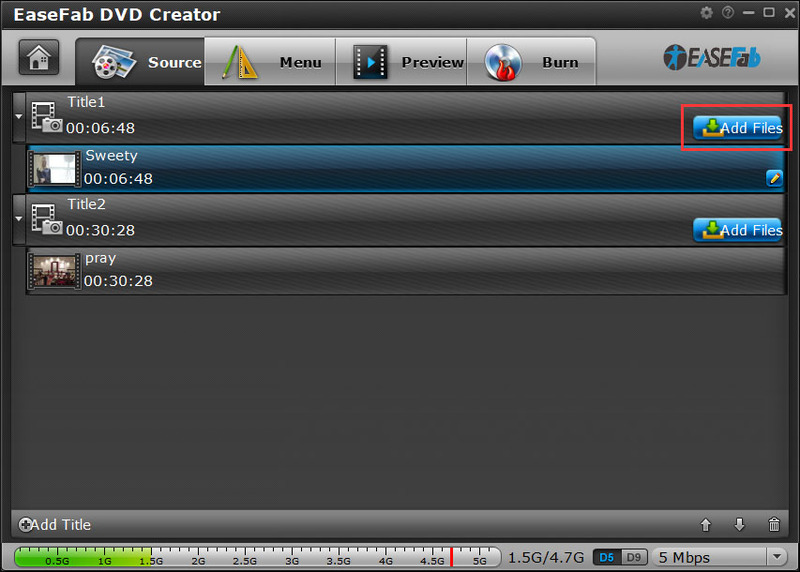 You can also burn videos to ISO files and DVD folder using the tool. You can set free DVD menu templates with different themes and add background image and music using the Wondershare software. DVD title can also be adjusted with respect to its color, font, size and other metrics. There is also a built-in-editor that allows trimming, rotating, cropping, and adjusting videos before burning. Video Converter Ultimate has fast burning speed with good quality. P.S. You can download EaseFab DVD Creator free trial for a try. The trial version allows you to burn your videos to DVD/ISO Image or DVD Folder with 3 times. A free DVD converter and burner not only has limited format support but also have limited features and functions. The table below summarizes the difference between EaseFab DVD Creator and free DVD burning software on various metrics.